﻿﻿﻿Our first project in 2010 was with the children of the New Delhi railway station who come every day to a Salaam Baalak Trust 'contact point' for food, medical attention and basic schooling. We wanted to help give their space a face lift and to ‘catch their imaginations’. With Alexis Halliwell at the helm we embarked on ten days of exuberant creative activity. Children’s tired faces would light up with delight as they walked in to the centre, clocked what was happening and entered the fray with paint brush or roller. Sometimes they just couldn’t stop and the paint overflowed, on to the cooler or the ceiling, on to each other. Anyone was welcome to join in: teachers and social workers, passing police men. The final outcome was a rather magnificent tiger and a jungle of other animals. They come up the stairs, so scared in their hearts as they see the police station, then their fear disappears as they see the paintings… they think, 'This is a place that will do something for children'. A social worker at the contact point, explains how the new boys at the centre reacted to Artreach's mural. In 2012 Naira Jansen and Charty Dugdale wanted to bring children from mainstream and marginalised backgrounds together for a creative project. Artscape happened over seven weekends at Humayun's Tomb and its neighbouring monuments. The 23 children (half of whom paid to participate, half of whom were invited) worked with Charty, Naira and the artists Ruchin Soni and Nidhi Khurana. The success of the Artscape project led to the founding of Khel Mel workshops in 2014. Charty was born and brought up in the UK. She studied Art History and English Literature at Edinburgh University, followed by a masters in Indian religions at SOAS in London. Her first job in Delhi was co-editor of an acclaimed hardback book about the lives of street and slum children - “If I were rain.” The title was taken from a painting workshop with the children of Salaam Baalak Trust. Charty established Artreach India as a charitable trust towards the end of her twelve years in India, so that the work she had been doing to bring art and artists into the lives of marginalised children would go on. She continues to be closely involved in the organisation, meeting weekly on Skype with the team in Delhi and visiting as much as possible, but always to chair Arteach’s biannual board meetings. In the UK she is working towards a masters in creative writing at Cambridge University. 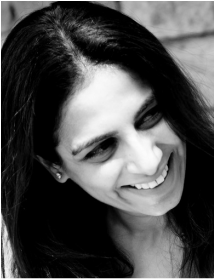 Deeksha is an art critic and curator specializing in contemporary Indian art. She has curated exhibitions is New Delhi, Kolkata, Berlin, London, Melbourne, Shanghai and New York for galleries, private and public museums and cultural state institutions including Kiran Nadar Museum, Devi Foundation, Asia House, Birla Academy, India Habitat Centre and Haus der Kulturen der Welt. She is Desk Editor of Art AsiaPacific magazine and her writings have been published worldwide in books, magazines and catalogues. Deeksha trained in Art History at Faculty of Fine Arts, Vadodara (B.F.A. ); in Arts Policy at City University, London (M.A.) and in Critical Writing and Contemporary Theory at Goldsmiths, London (M.A.). Deeksha is a Charles Wallace Scholar and an India Foundation for the Arts Fellow. Aryakrishnan is a researcher and artist based in New Delhi. He completed his MA in Visual Arts from School of Culture and Creative Expressions, Ambedkar University Delhi in 2014. He was a young curator for the Students Biennale of Cochin Biennale 2014, and 2016. Along with Juggleheads, he curated the shows ‘stutter in your eloquence ‘(2014) at BC Gallery Cochin and ‘stutter in your eloquence-II’ (2015) at Ambedkar University Delhi. As an artist he explores mixture of medium and forms from drawing to poetry and performance. Preeti is an art educator, stimulating young minds towards creative learning. She initiated her career with Heritage awareness in rural community and then taking it to schools in Delhi through NIE (TOI). Though she worked in the field of Conservation for auction houses, archive libraries, museums, etc. her interest in Education led her to work for various cultural organizations. She has worked with Flow India for facilitating young minds with an experiential pedagogy. She has studied Conservation and Heritage Management and an ardent lover of culture and Heritage. Naira Jansen is an educator who taught at the American Embassy School, New Delhi for many years and also served as Director of Apple School, a preschool on the American Embassy compound. She founded Khel Mel with Charty and continues to mentor the programme - born from the belief that it is important to provide opportunities for children to pursue their passions and engage with the world around them in meaningful ways. Sonya Dixon is a communications specialist with a passion for art. She has been involved with Artreach since its inception, helping to create meaningful projects and partnerships in Delhi. Sonya is now based in the UK.